As an Interior Designer, Lauren has an appreciation for all colors. However, from a very young age, purple (specifically lilac) has always been “her color”. Our parents chose to dress us in the same clothes when we were young, but with our own colors to tell us apart. When Design Shuffle came to us and asked us to host them in our Guest Blog segment, we were excited by the opportunity. We were even more excited to find that some of the pictures they selected for this post are ones Lauren has been holding onto for years in her favorites file. Thank you to Design Shuffle for sharing your design inspiration with us. Hello, everyone! It’s Mari here from Design Shuffle, a fabulous online community where interior designers from around the world can show their work and design enthusiasts can find inspiration for their own projects. As part of my job, I often have the pleasure of visiting lovely blogs like Side by Side Design to share some of the great decorating ideas I’ve discovered. 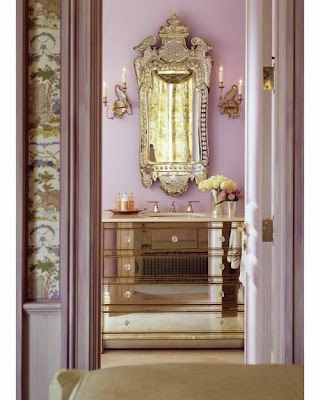 Today’s guest post is all about lilac rooms. Interior designs infused with this lovely hue are feminine and relaxing. We’ve pulled together eight of these beautiful spaces for your viewing pleasure and inspiration. Enjoy! Long drapery panels and toss pillows add a pale splash of lavender and pink-toned lilacs to the neutral color palette in this relaxed living space. Once again lilac adds its deft touch to a neutral palette. I love the simple slipcovers and tall decorative elements on the table. 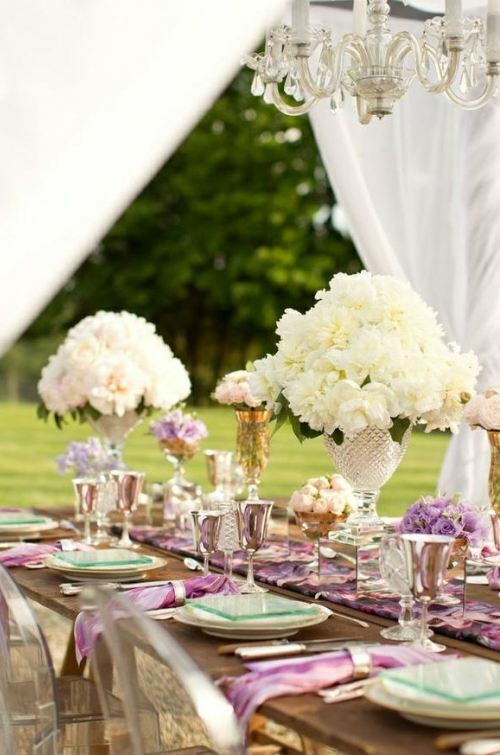 An array of pale to bright purple tones brings feminine appeal to this outdoor celebration. Aren’t the ghost chairs perfect around a simple wooden table? Adding lilac cushions on a white chaise lounge is an unexpected but lovely way to introduce lilac into this pale turquoise and white room. White piping on the cushions is a crisp detail. The wallpaper in shades of lilac provides a beautiful background for this modern bedroom design. The draperies, tufted velvet headboard, and X-stools pull their color from blooms on the wall – so pretty. A gorgeous Venetian mirror and wall sconces over a mirrored dresser turned sink base looks stunning against a lilac painted bathroom wall. I love the wallpaper in the bedroom – wish we could see more of it. This young girl’s room is so pretty decked out in shades of lilac and purple. Once more the wallpaper catches my eye. 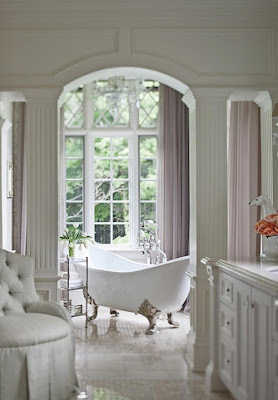 With just the palest whisper of lilac, milady’s bath gets a touch of glam from a silver-footed tub. 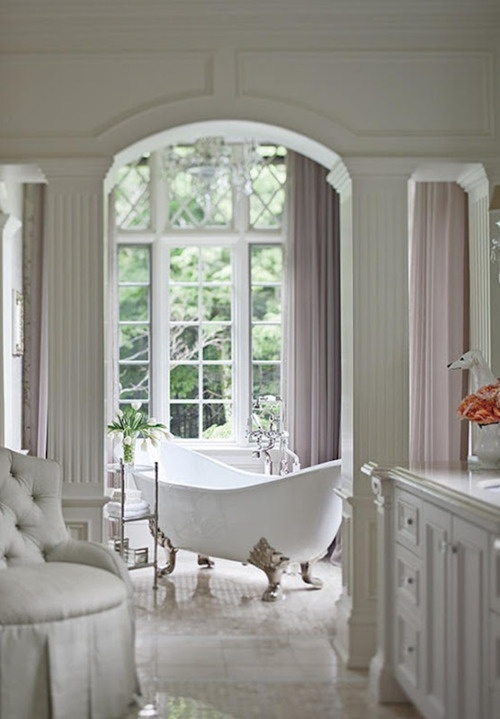 Tall windows, an arched entryway, a crystal chandelier – all create the perfect space for this clawfoot tub to shine as focal point. Do you feel inspired by these interior designs? Leave us some comments below, and visit Design Shuffle at http://www.designshuffle.com/ for a daily dose of design inspiration and ideas! According to Jewish tradition, “Sheva Brachot” are the Seven Blessings that the Bride and Groom are given at their wedding (a blessing over the wine for sweetness and enjoying life, a blessing that all the people of Israel should rejoice with the Bride and Groom, etc.) After they are married, for seven nights they are reminded of this beautiful ritual event by attending family and friend’s homes for dinner where the “Sheva Brachot” or Seven Blessings are recited. Recently, we had the opportunity to attend a beautifully hosted dinner at our sister Rebecca’s friend’s home. As this was our first experience with “Sheva Brachot”, we were not sure what to expect. Since many of our readers have probably never experienced this as well, we thought we would share this with all of you. For observant Jews, every full meal begins with hand washing. Our hosts set up a hand washing station outside where we were eating. Before saying the blessing over the bread or “hamotzi” you must wash your hands while saying the hand washing prayer. Once the prayer is said, you do not talk until you recite the second blessing over the bread which is quickly followed by eating a piece of the bread or “challah”. In this case, the bread was conveniently placed next to the hand washing station so guests could do all of these things at once. Adorable bridal themed paper plates were used along with matching napkins. The napkins were wrapped around plastic silverware and tied with a simple silver flower. We love their attention to detail. Our meal began with delicious homemade garlic knots and a jicama salad with red onion, avocado, and grapefruit. The Bride and Groom share a love for sushi which is why Rebecca’s friends decided to have California rolls (with imitation crab of course) and tuna rolls as an appetizer. Dinner was set up buffet style. We had the most incredible baked salmon, an option between penne or spaghetti noodles with a variety of sauces ranging from traditional marinara to pesto to garlic cream, and this salad bar was complete with all the fixings. After joining together to say the prayer for finishing a meal or the “birkat hamazon” and allowing seven guests to bless the Bride and Groom by reciting one of the Seven Blessings, we enjoyed a delicious dessert. This included Scottish shortbread cookies (in honor of the groom who is originally from Scotland), brownies in mini baking tins, and apple cranberry turnovers. An adorable Bride and Groom figurine was put out as the centerpiece at the dessert bar. As “Sheva Brachot” only lasts one week after a wedding, Rebecca and her new husband are done attending these events. However, their time for being blessed as a couple is just beginning. We wish them a lifetime of blessings. Mazel Tov! After over a month of construction, Lauren and Scott’s home remodel project is almost complete and they can’t wait to see it finished. Lauren said she can really relate to her clients best while her own home is under construction. It is not fun living amongst dust, dirt, and people in and out of your home, but the end result is well worth it. Here is a sneak peek into the renovations. We cannot wait to share the finished pictures with all of you. The main components for the redesign in the master bedroom consisted of; creating an all new closet, replacing an existing window with french doors, adding a pocket door leading into the bathroom, building new furniture (dresser, nightstands, and headboard), and a fresh paint job. In our previous post, Master Bedroom Inspiration, we show inspiration photos detailing Lauren’s initial design for this space. She used the majority of her original ideas and changed a few to create a beautiful and modern sanctuary where she and her husband can relax. The original closet was gutted, extended, and recreated. A new pocket door creates an entryway into the new and improved master bathroom. There was nothing appealing about the old bathroom from the 50’s with it’s original peach colored plumbing fixtures and tile. The much needed remodel included everything from new tile and flooring to cabinetry, modern plumbing fixtures, recessed lights, a glass shower enclosure, and even a new toilet. In our Bathroom Remodel Inspiration post we showed inspiration pictures for the cabinetry style as well as some of the other main details she planned to incorporate in this room. We also showed specific materials and fixtures already purchased for this space. Demolition begins in this bathroom from the late 50’s. The layout stays the same, but the look will be drastically different. … and the toilet stands alone. Cement is poured before the tile can be set. A sneak peek at the new clean lined modern bathroom. The bedroom layout will basically stay the same, however the placement of the door entering the bathroom needs to be moved a few feet to accommodate the new bathtub. A face-lift is in order for this bathroom as well. It will feel refreshed with it’s new flooring, cabinetry, plumbing fixtures, and crown molding. The shower is being replaced with a bathtub, and the old tile has got to go! The old narrow countertops do not even fit today’s sinks. Our dad built a beautiful new cabinet for this space, and we can’t wait to see it in person. Lauren and Scott feel blessed to have such talent in their families. Our dad has been at the condo overseeing this project each and every day gathering subcontractors and materials for each part of the job. Scott’s dad has ensured that all of their plumbing and electrical fixtures are top notch. The best part for Lauren has been seeing her vision come to life while being given the opportunity to work “side by side” with her dad, something she has waited a long time to do. It is officially Tami’s first week of summer vacation, and as an ode to her second grade class, we would like to share her end of the year science unit with our readers. It all began in the middle of April when this small box got delivered. Tami’s students had been anxiously waiting for their class caterpillars to arrive and had been studying the stages of the butterfly life cycle in preparation. The larvae came in this plastic container and the nutrients at the bottom helped them to grow. Tami’s students were excited to come into the classroom each morning and watch the progress of their caterpillars. The caterpillars quickly grew big and fat from eating all of the nutrients. Then they climbed up into the top of the cup, got comfy, and built their cocoons (or chrysalids). Tami transferred these delicate cocoons into a butterfly net so they would come out inside their new home. When the butterflies came out they left their cocoons behind staying close to the lid as they learned how to fly. Every other day Tami’s class collected flowers and leaves from their school’s courtyard and fed their Painted Lady butterflies by sprinkling sugar water on the flowers. 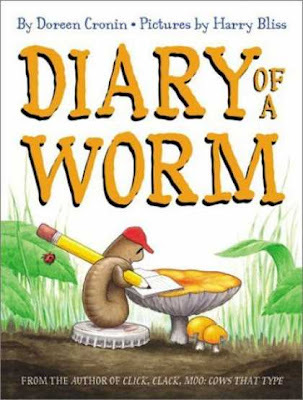 The “Diary of a ______________ (worm, spider, etc. 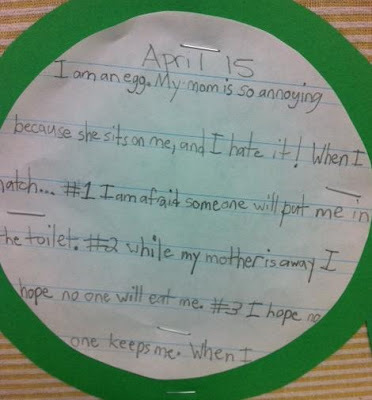 )” series by Doreen Cronin was Tami’s inspiration for her class writing assignment. These adorable fiction stories are written in the voice of the insects. For every day of their short lives they tell of their adventures. 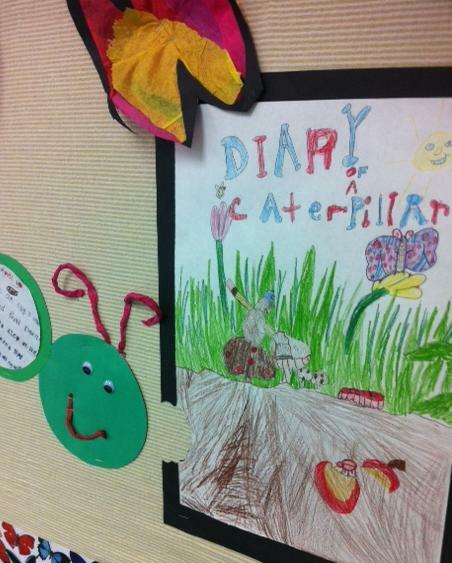 One of Tami’s students designed and drew the cover for their class book, “Diary of a Caterpillar”. It was then backed with black paper and cut out to look like there was a big bite taken out of it. Each diary entry was written by a different student on lined paper and backed with a green circle to complete the body of the caterpillar. 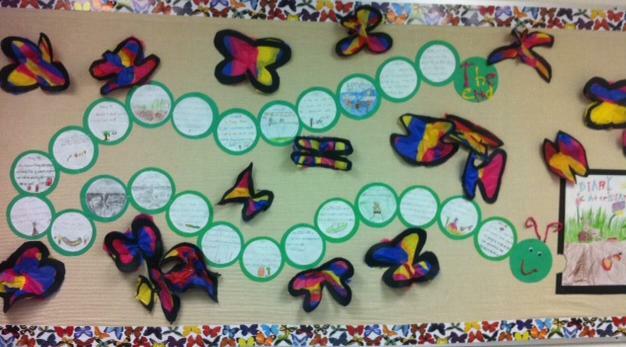 Each student wrote and illustrated their own diary entry based on one of the four phases of the butterfly life cycle (egg, caterpillar, chrysalis, and butterfly). They were then put in order by date and put up on a classroom bulletin board. 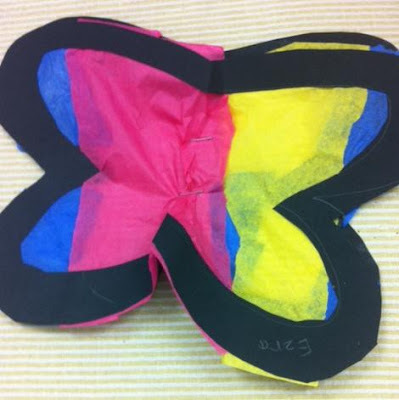 Students also created these butterflies by cutting a frame out of black construction paper and filling it in with different colored tissue paper. 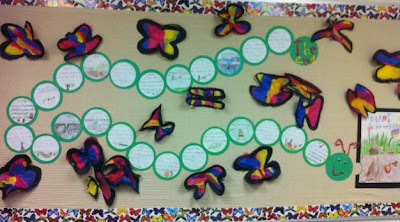 This finished bulletin board was displayed at Open House for parents and families to see the whole project.They were also introduced to the class’ pets as each second grader proudly announced that they had watched them grow from tiny larvae into beautiful butterflies. Last week, as Tami’s students prepared to move on to third grade and Tami prepared to let them go, she found it fitting that her class let their butterflies go as well. Her students shared their wishes for their beloved Painted Ladies expressing that they “hope they find a nice shady spot to lay their eggs” and that “each butterfly enjoys flying free”. As Tami opened the zipper on the net and allowed the butterflies to fly she and her students shared a slightly emotional moment saying good-bye to second grade and their time together as a class. Best of luck to all the students out there who are moving on to the next grade, to their parents who will allow them to spread their wings this summer, and to all of the teachers who have the next two months to fly free. In honor of Father’s Day, we would love to introduce to all of you our grandfather. He is a docent at the Los Angeles Zoo, a grill master, and a gardener extraordinaire. We love to visit our grandparent’s home in the valley for brunch, dinner, or just to hang out with the family, and we rarely leave empty handed. He almost always has an overabundance of fresh fruit and vegetables from his garden, and insists everyone make a take home bag before they leave. A few weeks ago, on one such visit to Grandma and Grandpa’s house, we scored some delicious yellow squash and zucchini from Grandpa’s garden along with a handful of mild peppers, tomatoes, basil, and parsley. As Lauren already had a package of ground turkey, some leftover spaghetti sauce, and shredded mozzarella cheese in her refrigerator we whipped up a dinner using all of these ingredients. 1. Slice zucchini and / or yellow squash super thin to layer the bottom of an oven-safe dish. Make sure to leave some on the side for another layer. 2. Add a layer of sliced tomatoes. 3. Cook ground turkey on the stove top in a pan until it gets nice and brown. 4. Mix spaghetti sauce, some cut up basil, and a chopped mild pepper in with the ground turkey to create your meat sauce. 5. Layer this mixture on top of the tomato layer. 6. Add another layer of zucchini and / or yellow squash. 7. Top with sprinkled mozzarella cheese and cut up parsley. 8. Bake in the oven at 350 until the cheese is bubbly and brown … and voila! The noodles were not missed in this super tasty lasagna. Happy Father’s Day to all of those fathers out there, and thank you Grandpa for sharing the “fruits of your labor” with us.